Online art zine Hyperallergic reports that artist Michelle Hartney has "post[ed] guerrilla wall labels next to the artwork of Paul Gauguin and Pablo Picasso [in the Metropolitan Museum], calling out their abusive or misogynistic histories." This is a very conservative gesture, assuming that images have an innate, necromantic power to infect viewers with bad politics, requiring written counter-incantations. It's also the spirit of the hall monitor, similar to fundamentalist Christians flagging or expurgating scenes in Hollywood films that don't agree with their worldview. There is also a kicking the dog quality to this. Can't stop that politician from groping staffers? Go annotate some century-old art and feel better about yourself. Below this image of Gauguin's "Jacob Wrestling with the Angel" appears an imaginary Hartney wall label. Enjoy! Paul Gauguin's bullying was intellectual as well as personal, as seen in his famous hounding of the gentle Vincent Van Gogh. Gauguin saw women as objects, and eventually pursued a stereotypical Western tourist dream of moving to Tahiti to indulge his appetite for submissive native flesh. The price of his toxic masculinity was dying poor, with syphilis. 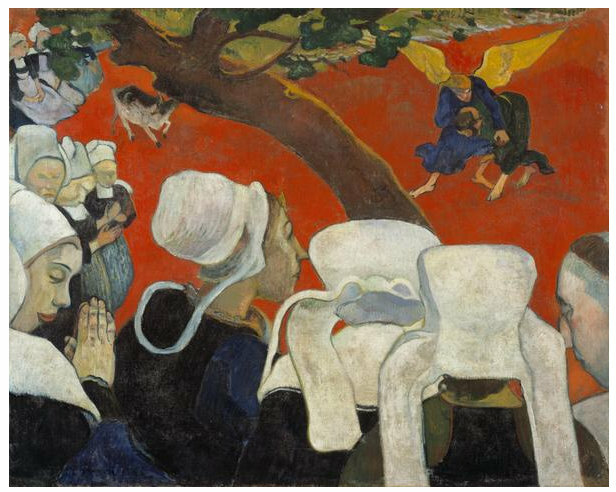 The meaning of Jacob Wrestling with the Angel is ultimately unclear, but given Gauguin's misogyny, it's significant that he depicts the women of Brittany in traditional head-coverings; likely he approved of this. The women have convened to watch a Biblical allegory of two males wrestling. Undoubtedly Gauguin was comfortable with such rituals of colonialist subjugation.